If you’re serious about working on your SEO for your website, you’ve probably seen countless debates online about switching your website from HTTP to HTTPS. It can seem like a daunting and super technical thing to do, but in reality, it’s actually quite simple. 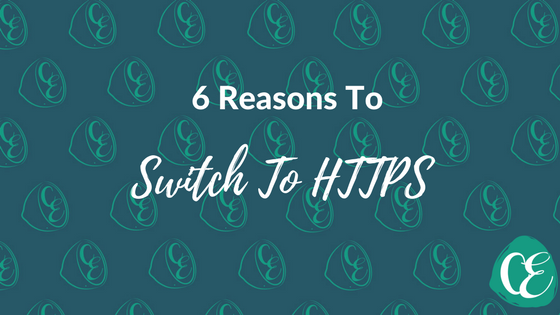 If you’ve been debating whether to switch to a secure domain, here are 6 good reasons to switch to HTTPS sooner rather than later. The first and most obvious reason to switch to HTTPS is to secure your website. Having a secure website reduces the risk that your website will become a victim to online hackers and keeps all data on your website, as well as any data collected from users such as names and email addresses, safe and secure. It’s crucial to switch to HTTPS if you are selling products online or have a secure member’s area where people can log in to your website. There have been several studies done that show online users are more likely to convert on websites which are secure. Whether it’s making a purchase online, downloading a PDF, or sending an enquiry form to the business, having that HTTPS label will make users much more comfortable to do take the action you want them to. Part of marketing and branding is increasing consumer confidence and allowing them to trust you before they decide to buy from you. When they search online and see your site is secure, that gives them the confidence to click through to your website. Google can show showing warning messages to users when they click on unsecured websites, both in search results and in Gmail accounts. When users get a warning directly from Google not to click on a link, it may well put them off proceeding and you may start to see a drop in traffic. This is not what you want – so get that HTTPS certificate sorted now! There is no doubt that having a secure website is favoured by search engines like Google and Bing. As long ago as 2014, Google called for websites to become more secure and implement HTTPS to make browsing safer for all users. Google has confirmed that having HTTPS is one of their ranking signals so making the switch to HTTPS is crucial these days if you take your SEO seriously. AMP, or accelerated mobile pages, have been a bit of a buzzword lately when it comes to digital marketing. Implementing AMP makes it easier for your content to load quickly on mobile devices but they do require an SSL certificate in order to be used. So if ranking well on mobile search is a priority for you, get your HTTPS sorted now. Did you know that making the switch to HTTPS can help to reduce the number of dreaded ‘direct’ traffic you see in Google Analytics? Adding HTTPS to your website adds an extra layer of accuracy when it comes to referral data as non-secure sites are often denied data from referrer websites which are secure. So if you want more accurate referral stats in Google Analytics, this can really help. Most hosting companies will add an SSL certificate to your website within minutes – it does cost extra (most are around $70-100 per year per domain) but when you consider what impact a drop in your business may have if people are not clicking on your website, it’s a small price to pay. When you do make the switch to HTTPS don’t forget to add the HTTPS version of your website in Google Search Console and submit a new sitemap. In Google Analytics you’ll also need to change your default URL from HTTP to HTTPS in the Admin/Property/Property Settings section to make sure you’re tracking the right version of your website. So there are 6 good reasons to switch to HTTPS. What are you waiting for? Make it the one thing you do for your website this week and switch to HTTPS.